JNC8 continues to march through NephMadness 2014. This controversial team was just kicked out of the NIH league and is in search of a home. Also, a minority of the authors have published a call to decrease the BP threshold to less than 140 mmHg in patients over 60 without DM or CKD. There are supporters of JNC8 though. The guidelines simplify the treatment paradigm allowing for a much simpler approach to the care of patients with hypertension. JNC8 has also put the discussion of hypertension research and clinical care back in the national dialogue. This is a good thing. We are not picking JNC8 because it is the definitive document for approaching HTN. This is not the case. We still have many holes to fill in our understanding of how to properly manage this complicated condition. From JNC7 to JNC8 we have had several large trials published that have rocked the hypertension community. Namely, the ACCORD-BP trial which was published in NEJM in 2010. The dogma at the time of this trials inception was that the lower we go for BP control the better. Well, side-effects were notably higher in the lower BP arm of this trial (<120 vs. <140 mmHg SBP) without mortality benefit. 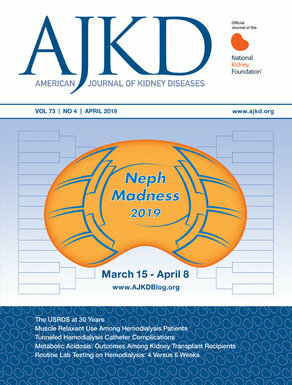 We like team Urgent Start PD and the fact that it went this far in NephMadness is a testament to the much needed attention we need for peritoneal dialysis utilization in the US. We understand that Urgent Start PD is not the only answer to the low rates of PD use in the US. However, it is at least AN answer and it appears to be successful in boosting rates of PD usage in many programs in the US. Because of this we had to tip our hat to JNC8. Next up for JN8 is team Balanced Solutions. Couldn’t ask for a match-up anymore different than this. Prospective, open-label, sequential period pilot study of 760 patients admitted consecutively to the intensive care unit (ICU) during the control period (February 18 to August 17, 2008) compared with 773 patients admitted consecutively during the intervention period (February 18 to August 17, 2009) at a university-affiliated hospital in Melbourne, Australia. During the control period, patients received standard intravenous fluids. After a 6-month phase-out period (August 18, 2008, to February 17, 2009), any use of chloride-rich intravenous fluids (0.9% saline, 4% succinylated gelatin solution, or 4% albumin solution) was restricted to attending specialist approval only during the intervention period; patients instead received a lactated solution (Hartmann solution), a balanced solution (Plasma-Lyte 148), and chloride-poor 20% albumin. The primary outcome was looking at an increase in baseline creatinine to peak creatinine and AKI as dictated by RIFLE criteria. They reported that the chloride restrictive group had a lower change in creatinine (0.16) vs. chloride liberal group (0.25). Interestingly they found a significant reduction in AKI with a much lower need for acute dialysis (78 in the liberal vs. 49 in the restrictive). However, no differences were seen in mortality or length of ICU stay. Several issues still exist for team Balanced Solutions. First, this was a bundle-of-care study, so it is far from definitive. We really need to see a blinded randomized clinical trial. Also, we need to study this topic on general medical and surgical wards. Team Balanced Solutions has the potential to be a real game changer in every day medicine and for that reason was an unexpected winner in its field. Beating out Normal Saline, KDOQI AKI Guidelines, Contrast Nephropathy, Bicarb in CKD, and now Belatacept. Arguably, having an easier rode to the NephMadness Championship. Now the big battle against team JNC8. Tune in next week to find out who will win.